So its accurate to within 20 years, can anyone narrow it down? Pictures may help. 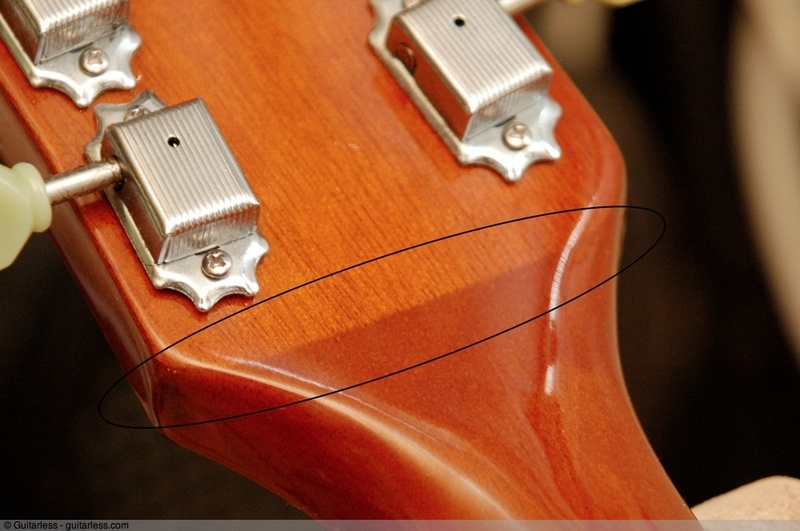 Little nuances such as TRC, headstock, logos, etc help. That number alone won't do it. And pics of the potentiometers too! With the numbers easy to read!!! Thanks guys, here are some more pics, its for sale locally and I am thinking I need a Les Paul. Does this look like a Standard? It was a fantastic guitar, very easy to play, long neck tennon, lovely action and feel to it. Now it being a 2002 model that was right before the move to China in 2003, my guess is they were totally ontop of their game at that point. Sadly I had to part with it. This guitar is 1995, 7 years earlier, I have noticed the logo , tuners and inlays are all different, will the rest of it be the same? And can I expect the same playability from it as I got from my old one? Also, whats the deal with 3 piece necks? How do you know if its got one or not? And how many pieces should the body be made from? Ok guys, it looks to have a 3 piece neck, are they all like this? Its kind of put me off until I know for sure, thought at first it was a repair. are they all like this? the newer ones have it more on the headstock..
Nice one, thanks buddy, I picked it up tonight, it's getting a clean, strings and set up. It's has a very low action with zero neck relief and no string buzz, I'm quite surprised at that. Pickups are Sam in the neck and Sam Sung in the bridge, never heard of them before. I will put some pics up later. The finish is nicely worn and sinking into the grain giving it a lovely aged look, so far so good. This is cleaning up nicely. A bit of spit and polish goes a long way, frets all shiny, board is cleaned and lightly oiled, just strings and a set up left, and a small chip that needs sorting. Anyone know what this finish is called? Anyone know what this finish is called? It looks a bit dark for honey burst, Ill have a Google. You could be right, modern honeyburst seems to be lighter around the edges and more transparent.